Students working closely with their faculty supervisors and carrying out field-based research into farmers’ practices and needs. Students, faculty and staff participating in capacity-building workshops in research, open educational resources (OER) and media production skills. Students’ work published in three ways: as OER multimedia learning packages for incorporation into degree programs; as information for farmers that is used for follow-up visits and extension materials; as research in master’s thesis and undergraduate student research. The OER published in appropriately leading to recognition for scholarship, teaching, research and extension. 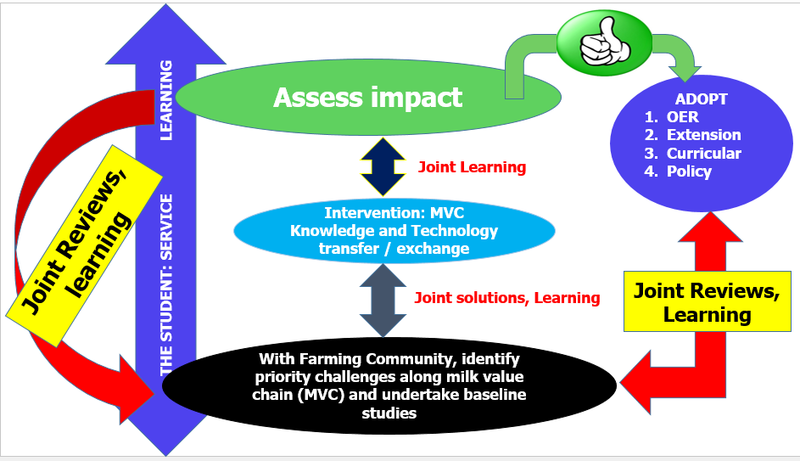 Through its objectives; a) create an enabling institutional environment to support the adoption of the AgShare student-centered research methodology, b) increase the number of good quality OERs produced to support agricultural curricula using the AgShare method and c) widely disseminate the AgShare methodology and quality peer-reviewed African OER, the Makerere University College of Veterinary Medicine has registered successes along its implementation of the AgShareII project. The teams have jointly identified the following research priority themes – water management, feeds, milking handling practices and acaricide management. Case studies, Video clips with interviews and still images have been developed covering a diversity of themes – residues, transportation methods, contaminants, disease epidemiology, presentations and management. A training course was held to support staff and students in courseware development. This course improved staff and students’ skills in instructional design for online courses, open licensing and the Agshare method and basic MOODLE skills. A farmer training event has been held with baseline data for individual farmers collected and analyzed by students.